The Imagination then I consider either as primary, or secondary. The primary Imagination I hold to be the living Power and prime Agent of all human Perception, and as a repetition in the finite mind of the eternal act of creation in the infinite I Am. The secondary I consider as an echo of the former, co-existing with the conscious will, yet still as identical with the primary in the kind of its agency, and differing only in degree, and in the mode of its operation. It dissolves, diffuses, dissipates, in order to re-create; or where this process is rendered impossible, yet still at all events it struggles to idealize and to unify. It is essentially vital, even as all objects (as objects) are essentially fixed and dead. NOTES: Samuel Taylor Coleridge divides imagination into two parts: the primary and secondary imagination. As the "living Power and prime Agent," the primary imagination is attributed a divine quality, namely the creation of the self, the "I Am." However, because it is not subject to human will, the poet has no control over the primary imagination. 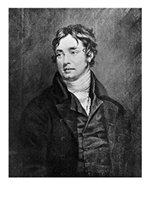 It is the intrinsic quality of the poet that makes him or her a Creator; harking back to Wordsworth, the primary imagination can be likened to poetic genius. The secondary imagination is an echo of the primary. It is like the former in every way except that it is restricted in some capacity. It co-exists with the conscious will, but because of this, the secondary imagination does not have the unlimited power to create. It struggles to attain the ideal but can never reach it. Still the primary governs the secondary, and imagination gives rise to our ideas of perfection. In this way, Coleridge and Shelley share the belief that inimitable forms of creation can only exist in the mind. As soon as the poet decides to write down his or her poem, for example, the work is inevitably diminished.